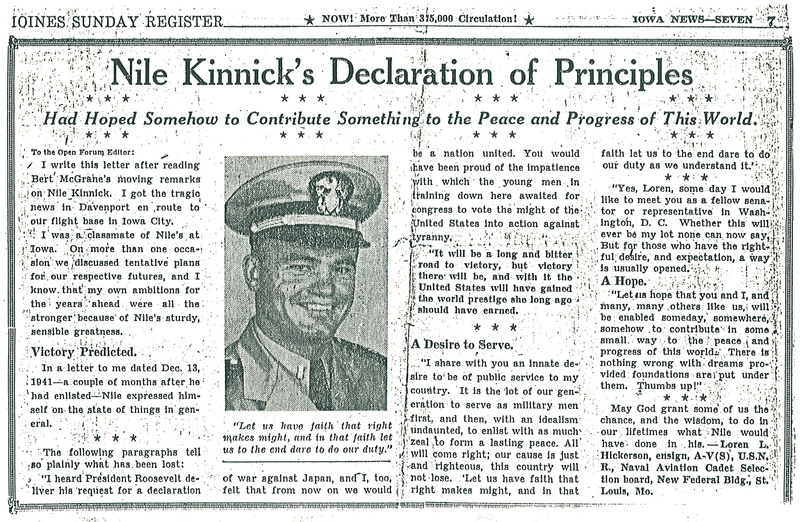 Des Moines Sunday Register Now More Than 315,000 Circulation Iowa News - Seven Nile Kinnick's Declaration of Principles Had Hoped Somehow to Contribute Something to the Peace and Progress of This World. To the Open Forum Editor: I write this letter after reading Bert McGrane's moving remarks on Nile Kinnick. I got the tragic news in Davenport en route to our flight base here in Iowa City. I was a classmate of Nile's at Iowa. On more than one occasion we discussed tentative plans for our respective futures, and I know, that my own ambitions for the years ahead were all the stronger because of Nile's sturdy, sensible greatness. Victory Predicted In a letter to me dated Dec. 13, 1941 - a couple of months after he had enlisted - Nile expressed himself on the state of things in general. The following paragraphs tell so plainly what has been lost: " I heard President Roosevelt deliver his request for a declaration of war against Japan, and I, too, felt that from now on we would be a nation united. You would have been proud of the impatience with which this young man in training down here awaited for congress to vote the might of the United States into action against tyranny. "It will be a long and bitter road to victory, but victory there will be, and with it the United States will have gained the world prestige she long ago should have earned. A Desire to Serve "I share with you an innate desire to be of public service to my country. It is the lot of our generation to serve as military men first, and then with an idealism undaunted, to enlist as much zeal to form a lasting peace. All will come right; our cause is just and righteous, this country will not lose. Let us have faith that right makes might, and in that faith let us to the end dare to do our duty as we understand it." "Yes, Loren some day I would like to meet you as a fellow senator or representative in Washington, D.C. Whether this will ever be my lot none can now say. But for those who have the rightful desire, and expectation a way is usually opened. A Hope. "Let us hope that you and I, and many, many others like us will be enable someday, somewhere, somehow to contribute in some small way to the peace and progress of this world. There is nothing wrong with dreams provided foundations are put under them.Thumbs up!" May God grant some of us the chance, and the wisdom, to do in our lifetimes what Nile would have done in his. - Loren L. Hickerson, ensign, A-V (S), U.S.N. R., Naval Aviation Cadet Selection board, New Federal Bldg., St. Louis, Mo. "Let us have faith that right makes might, and in that faith let us to the end dare to do our duty."